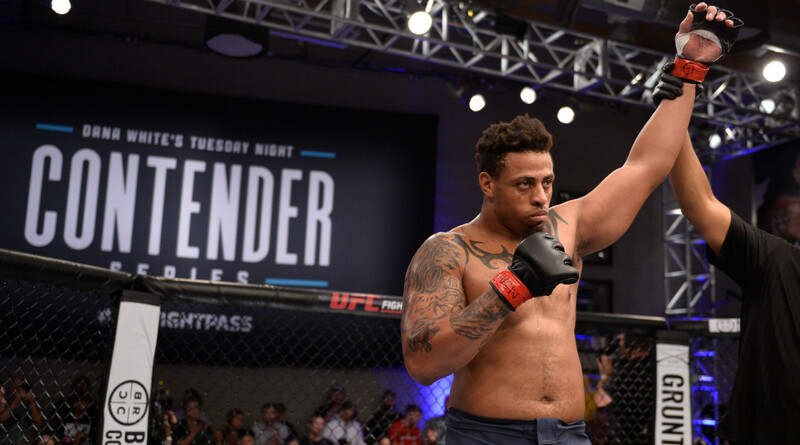 According to ESPN's Brett Okamoto via UFC president Dana White, former NFL defensive star and controversial figure Greg Hardy will make his official UFC debut on the promotion's ESPN+ debut on January 19th. The 30-year-old heavyweight transitioned into MMA into 2016 as his NFL career ended and after winning two amateur fights, he was signed by the UFC to essentially a 'first look' deal. He made his professional debut on Dana White's Contender Series earlier this year, winning his first two fights by first round T/KO. He followed that up with another knockout win outside the Series. While the fight hasn't yet been signed, he is expected to face Allen Crowder (9-3) which is problematic for a fairly large reason. Hardy has a past with domestic violence, having been arrested in 2014 for assaulting an ex-girlfriend. After being found guilty of assault and communicating threats, he was sentenced to 18 months probation but he appealed and requested a jury trial. The victim failed to appear in court to testify and the prosecution had to drop the case. He was later deactivated by the NFL and placed on the commissioner's exempt list before an arbiter reduced a 10-game suspension to four games. Also fighting on the January show is Rachael Ostovich, a women's flyweight who is recovering from domestic violence injuries suffered at the hands of her husband, an MMA fighter who was arrested on second degree assault charges and is awaiting trial, claiming self defense. The reaction has been loud from fighters and media, both those involved in the sport and not. Ostovich is set to face Paige VanZant on the show which, as of now, doesn't have a main event.